Got One Day in Berlin? Here’s What To Do, See, Eat, and Drink! Heading for Berlin but short on time? You might need a bit of help to plan out the perfect short Berlin trip then! 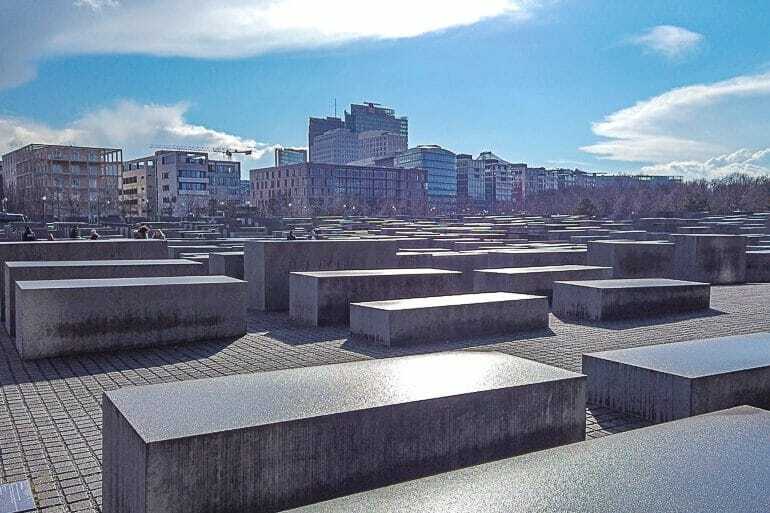 Whether you want to spend a few hours, a half day in Berlin on a stopover, or even a full day in the capital city, we have a Berlin itinerary to suit you. Think of this post as a mini trip planner – providing you with ideas for your meals, sights to see, ideas for the evening, and more! We love Berlin – and after having explored it a bunch of times now, we think we have a pretty good idea of what to see and do. There are definitely some must-see attractions if you are only in Berlin for one day – and we cover most of them below. So, to make it easy for you, we’ve written out what we think is a perfect Berlin day guide. 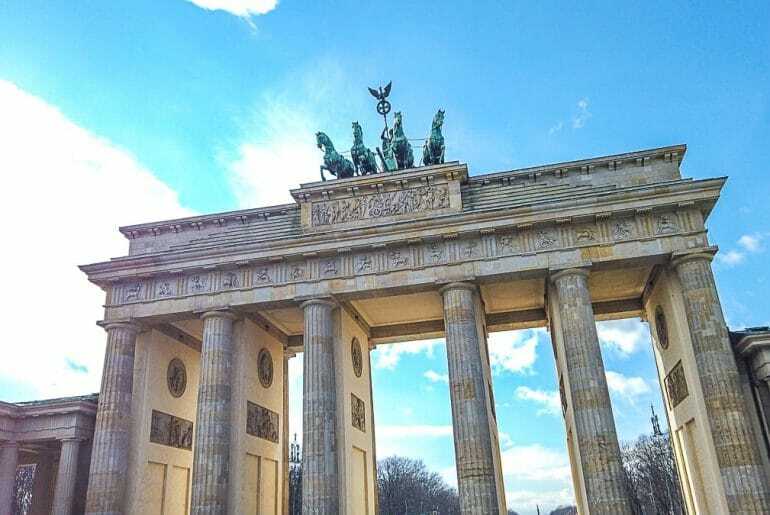 From exploring the historical sights like the Berlin Wall and the Brandenburg Gate to finding a great cafe for a rest, here’s how you could spend one day in Berlin! Oh, and if you want a Berlin in one day map – we’ve got that for you, too! To make it as easy as possible to plan out the day/hours you have in Berlin, we have created a numbered map. The numbers – followed in order – will walk you through a day from sunrise to going out in the evening. The numbers will also correspond with the items in this post for easy comparison! You can actually follow this Berlin day as is but of course you can feel free to switch things out as needed. Since Berlin is pretty spread out – and features a lot to see in a single day – the map should be a good visual reference to see where things are in proximity to one another. Basically, follow the map in order as you go about the way. You can feel free to skip things if you aren’t interested in them. You could also choose a different place to eat or drink as long as you know where the next suggested stop is! Personally, we think this is a pretty good day – but we wanted you to be able to plan ahead to meet your unique needs! 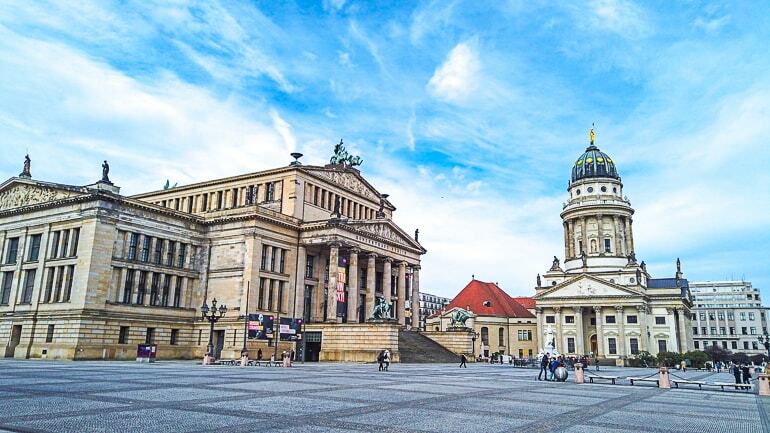 Generally, Berlin is a spread out city with many of the top attractions in the middle – Berlin Mitte. You can certainly walk between things in the afternoon but you will have to take public transit to complete the morning portion of the itinerary as is. Having said that, Berlin has a pretty good transport system for you to use. The system consists of four main ways to get around: subway (called the U-Bahn), street trams, buses, and S-Bahn trains (overground metro). Use the BVG Website to plan routes and learn about fares and more. For this itinerary post, we’d suggest you buy a day ticket for zones A + B which is all you need if you stick to this itinerary. This will make getting around so much easier. With a day ticket, you can hop on and off easily. You can buy it at the ticket machines and it currently costs 7.00 Euro – just a few rides and you will cover that cost easily. Just remember to validate it before you get on the transit. Alternatively, you can take a bike tour around Berlin to get a local vibe and some exercise with a knowledgeable guide. You could also buy a hop-on hop-off bus tour and use it as a way to get between top attractions in Berlin. Just an idea! Okay, so now that you have an idea of how to get around the city and how this itinerary will work, let’s dive in. Here is our Berlin itinerary including meals, drinks, coffee, and sights. We even mention addresses and all the convenient transit stops close by to the restaurants or attraction! Given that everyone’s timelines will be different – if you do end up staying a night – you can check here for accommodations in Berlin. 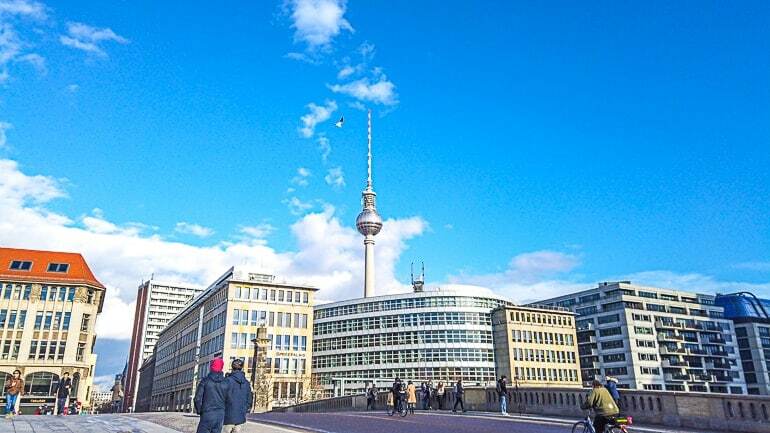 Check out Berlin Meininger Central Station for a hotel and PLUS Berlin or Alcatraz Hostel for great hostels (both very much in/close to Berlin Mitte) close to all the best attractions. We also have a whole guide on great hostels in Germany, if you need. This is the Alte Nationalgalerie – and there is water just to the right and all around the island! Good morning! If you want this itinerary to start at breakfast, then skip this section! If you are up (or perhaps you never went to sleep because you went clubbing OR had an early flight?) then you should catch the sunrise over the city. To do this, you can head to Museum Island in the city centre. The reason we picked this spot is that the various museums and structures on the island (we will cover them below) look amazing in the morning light. What’s more, the Spree River surrounding the island reflects the water making for a tranquil place and amazing photos. Pro Tip: If you stand near the north tip of the island, you get the water reflecting nicely off the Bode Museum’s round outer structure. There’s also a large park area (Lustgarten) which has the Berlin Dom (which you can check out later). If you did want to visit one or more of the museums on the island when you visited the Berlin Dom later in the afternoon, you can do so. After all, it’s your day! 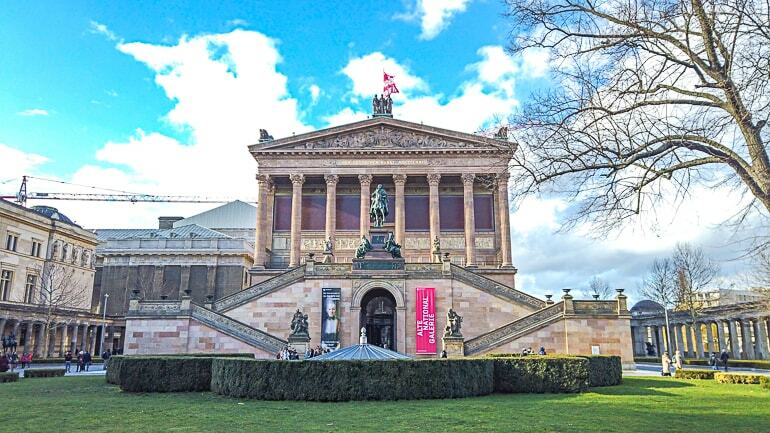 You can find the Pergamon Museum, Alte Nationalgalerie (shown above), Neues Museum, Altes Museum, Bode Museum, and more on the island. Now that you’ve got your photos and a bit of fresh air, you can head for breakfast. Berlin is known for its breakfast – so head to House of Small Wonder to start your day off right. It’s pretty central – just north of where you just came from at Museum Island. It’s only a few blocks, so you should be fine walking there. At House of Small Wonder, the menu has a variety of great breakfast options to suit different tastes and diets. Their biscuit Benedict is top notch and a popular item that sells out fast – so make sure you go early if that interests you! If you want to learn more about House of Small Wonder, check out their website here. Keep in mind, they are a cash-only establishment and don’t take bills larger than 100 Euro! Once you are done with breakfast, you will need to get going to begin your jam-packed day. In the morning, you can explore the “outside” of the city centre to then do the middle of the city in the afternoon and evening. Basically, we’re starting far in the morning while you have the most energy and working our way in! Here are some attractions you can visit – and feel free to skip what doesn’t interest you. Just move to the next one! One of the most popular pieces on the whole of the gallery! If you are only in Berlin for a day, there is no doubt that an attraction you will want to see is the Berlin Wall. This oppressive barrier – erected in August of 1961 – fell in 1989. Today, the wall is of the most universally recognized symbols in the world. Luckily, there are a few places you can see it – one of the most popular being the East Side Gallery. Located in the east end of Berlin, this 1.3 km long stretch of the wall that is still standing has been decorated by various artists over the years – each leaving their unique style. You can walk the length of the gallery and check out each of them. It’s moving and fascinating. Close by to the East Side Gallery is the Spree River and the beautiful Oberbaum Bridge. This whole area is actually quite popular for night clubs in Berlin so if you want to you can come back in the evening to try out the scene. 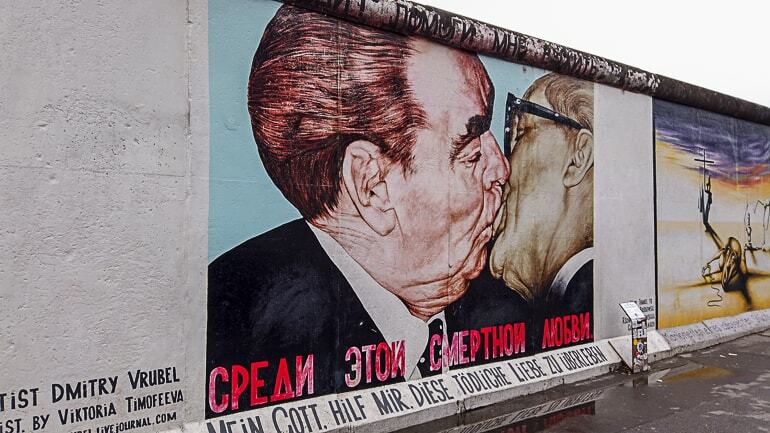 For now, you can learn more about the East Side Gallery at the Visit Berlin site. The other really good place to learn about the Berlin Wall and the history of Berlin (and Germany, for that matter) is the Berlin Wall Memorial. Located more in the north end of the city, this memorial includes a museum and some green space. The highlight is the fact that a section of the Berlin Wall has been preserved to show exactly what it was like to try and cross it decades ago. As such, you can see the wall with the “full barrier” in place behind it – which included barbed wire, trenches, guard towers, sand, and other deadly additions. You can learn more to plan a visit here. To continue o the journey of Berlin attractions located outside the city centre, you should head next for Charlottenburg Palace. Located in the west end of the city, the palace is the largest palace in Berlin. It was built back in the 17th century and has endured a lot of history (bombings) and changes (additions) over the years! These days, you can visit the grounds and palace for a fee – with Christmas markets happening in the wintertime! To learn more, you can check out the Charlottenburg Palace website. You can find actual Canadian poutine at the Markthalle!!! So it’s lunchtime, and you’re finally done exploring the “far” attractions in Berlin. Time to head back to the east/centre of the city a bit and get ready to dive into a delicious lunch. What are we suggesting you eat? Well, head to Markthalle Berlin so you can choose for yourself! This old market hall building actually has a long history as a functioning market space in Berlin. Now, the place is absolutely packed with food vendors from around the world selling different cuisines. 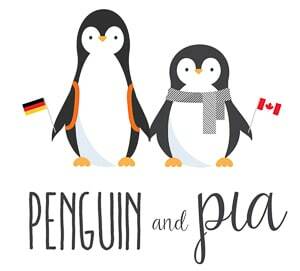 You’ll find Peruvian ceviche, Serbian/Balkan-style food, fresh fish, cafes, places for German beer, and – of course – classic Canadian-style poutine! Basically, the reason we ended up there was because we had heard that The Poutine Kitchen was serving up arguably the best poutine in Germany. Naturally, Eric (the poutine master and Canadian) had to test it out. It was actually really good – very close to home! Nothing like fries, cheese curds, and gravy to fill you up! 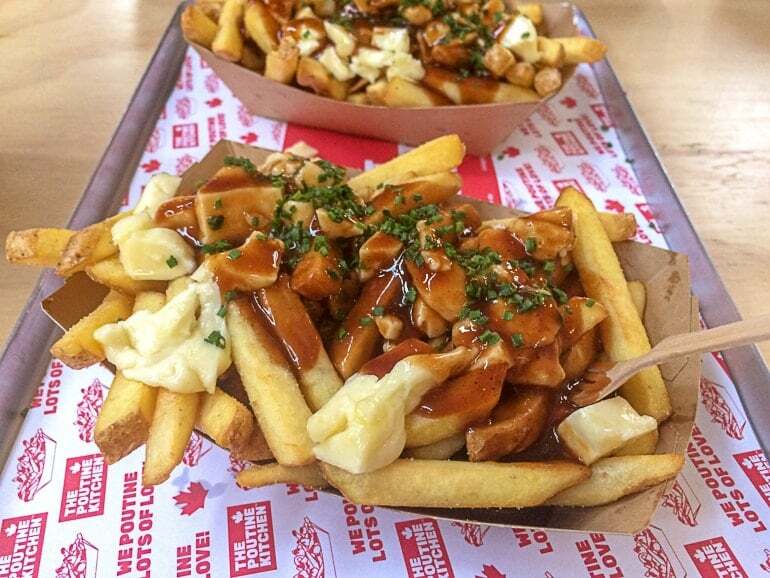 You don’t have to get poutine (but you should) and if you want to learn more about the market, you can check out the website here. Alright, so it’s the afternoon and now that you are full of amazing food, you can walk it off in the centre of the city. This is where many of the top attractions are – so follow the itinerary to check out the ones you want! Pro Tip: Time depending if you wanted to learn about the history of Berlin, you should consider a guided history walking tour. This area in the city centre is packed with historical attractions and hearing about them from a guide makes such a huge difference. Eric did a walking tour in Berlin and absolutely loved the guide’s enthusiasm, passion, and knowledge! If you need a bit of time to walk off lunch and want to check out some green space, then you can head due south of the Markthalle to the largest park in the city – Tiergarten! You might see it written as Großer Tiergarten. There are walking paths that cut in all directions and lead to amazing monuments, ponds, and more. You can check out the massive and beautiful Victory Column in the middle of the park (more or less) and the Soviet War Memorial closer to the east end of the park (where you are heading next). Walk among the memorial – and be sure to go under it, too! Once you exit the park, you will end up right by the Brandenburg Gate. You can look at it, but don’t go nuts just yet because there’s another stop we think you should make first. Just south of the Gate you will find the Memorial to the Murdered Jews of Europe. This massive open area has over 2700 concrete “stelae” erected to artistically serve as a reminder of the past. The grounds are free – and you can even visit the exhibit/museum underneath the memorial which has more information. You can learn more about the information centre exhibit here. The one, the only – the Brandenburg Gate. 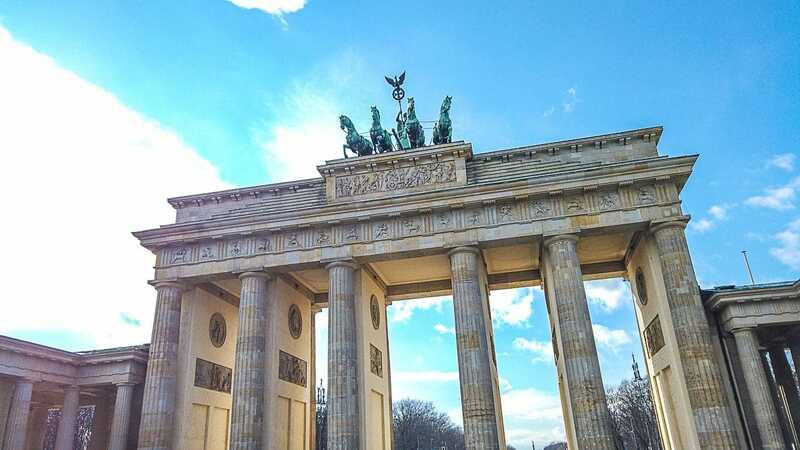 After you check out the memorial, pop back up to one of the most famous sites in Europe – the Brandenburg Gate. Built back in the 18th century, this monument has served a few functional purposes over the years – so it’s not just pretty to look at! Located in the city centre right on Pariser Platz, the Gate is a popular photo spot loaded with history. You can also visit the Brandenburg Gate Museum right beside the Gate to learn all about it if you choose! The Reichstag and its beautiful dome on top! After the Gate, head through it (back into the park a bit) just a block north. 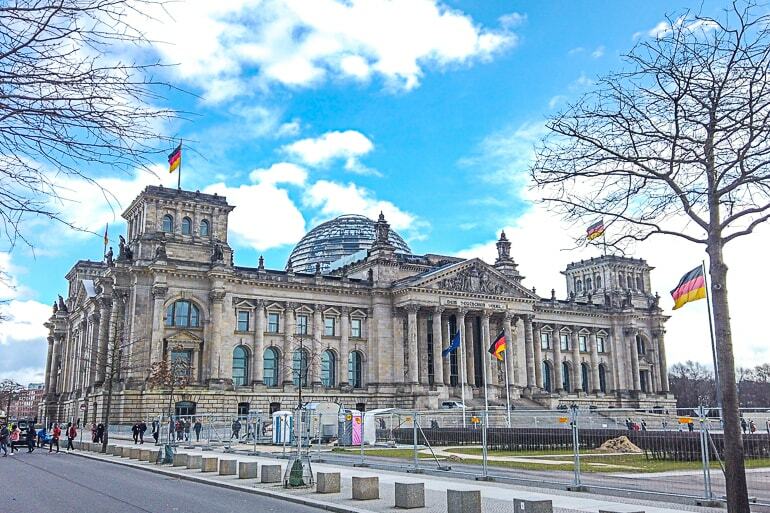 You will be greeted by a massive building with a glass dome on top that you should check out – the Reichstag! The German Parliament building – built back in the 1880s – has been through a lot over the years having been damaged numerous times by fire, bombs, and war. These days, it serves as the official house of the German Parliament (Bundestag). While the photos of the outside look gorgeous, you can actually enter it, do a tour, and climb the glass dome on the inside ramps with views of Berlin! That said, you do need to pre-register your details to clear security if you want to do a tour – so if you are in Berlin for a day do this in advance (if you can). We’ve both been inside and up the dome and it was honestly really interesting. The audio guide is great and the views you get are worth it! For you being in Berlin for only a day, to make this visit possible, you might consider a line skip ticket and live tour of the Reichstag Dome. Once you are done at the Reichstag, hop on transit (or you can walk) to another one of the most famous sights in the city – “Checkpoint Charlie”. This tiny guardhouse on Friedrichstraße served as one of the entry points dividing East and West Germany during the Cold War. 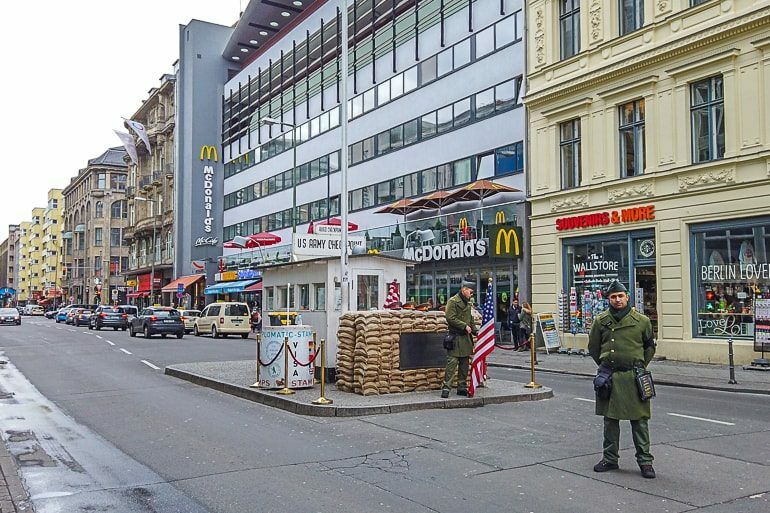 These days, you can walk across the old border freely – and visit the museum called the Wall Museum (Haus am Checkpoint Charlie). Here, you can learn about the history of the spot – and why it’s so famous after all these years. Lisa went to the museum years back and remembers it being quite interesting. We think it’s important to stop into the museum since the spot alone can feel touristy and underwhelming – which is a shame because it’s actually SO important. To plan your visit, you can do so here. 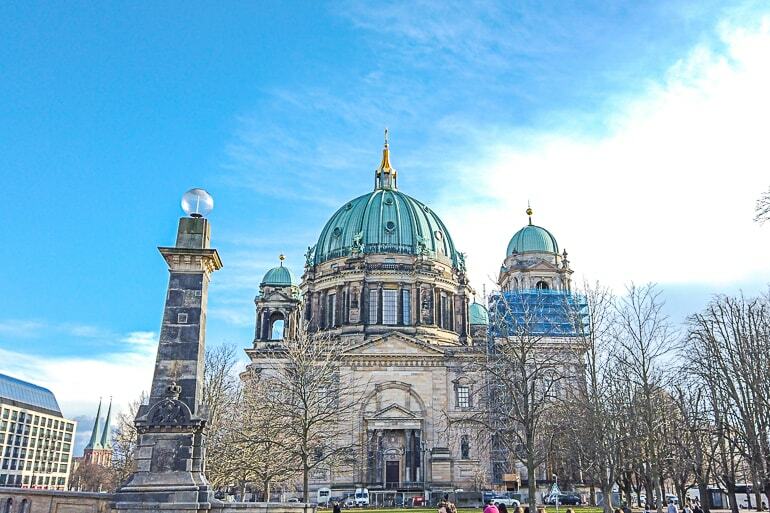 The Berlin Dom is gorgeous – from all angles! Finish off at Checkpoint Charlie and head over to where you started in the morning for another famous sight. If you woke up for the sunrise, you might now find yourself back on Museum Island looking at the Berlin Cathedral. First built back in the 16th century, this version stands from the early 1900s. With a massive pipe organ inside and a city views from the outer dome walkway, it’s a popular place to check out. You can learn more about prices and times here. Keep in mind that it is an active place of prayer so be respectful! Now that you’ve had an afternoon wander checking out the top tourist sights, it’s time for a break. For this, you should wander back to that area we’ve mentioned a few times for a coffee – Hackescher Markt! This popular area/public square/transit stop is full of shops, bars, restaurants, patios, and more. The coffee and baklava at Ben Rahim was fantastic! 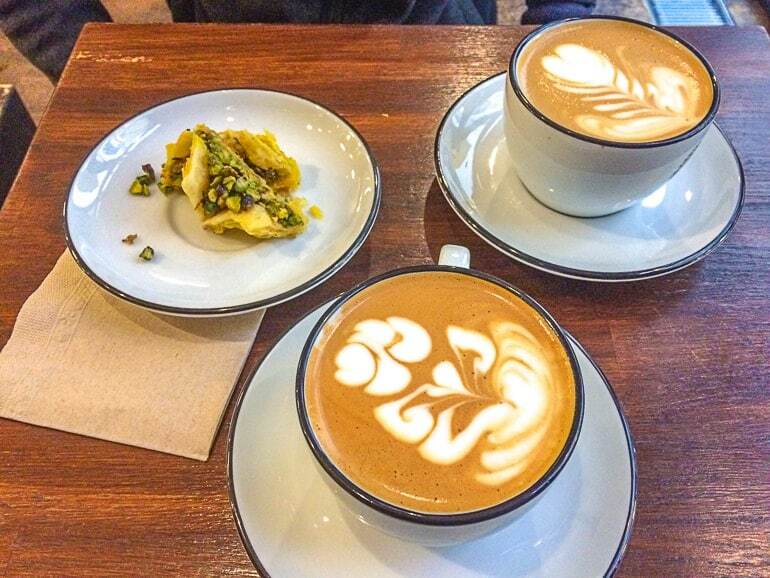 Ben Rahim is described as a coffee place with a bit of an Arabian twist. We had amazing coffee travelling around the Balkans and so we’ve gotten a bit particular about our java. Lisa looked up great cafes – and Ben Rahim did NOT disappoint! The shop itself is TINY but we got a seat, two flat whites, and a baklava. Everything was amazing. The vibe was very, very cozy, too. Even though it’s hard to find, they have outdoor seating in the front alleyway. We highly recommend – and you can find more information here. Röststätte Berlin is a chain – but still cozy and great for coffee and a rest! 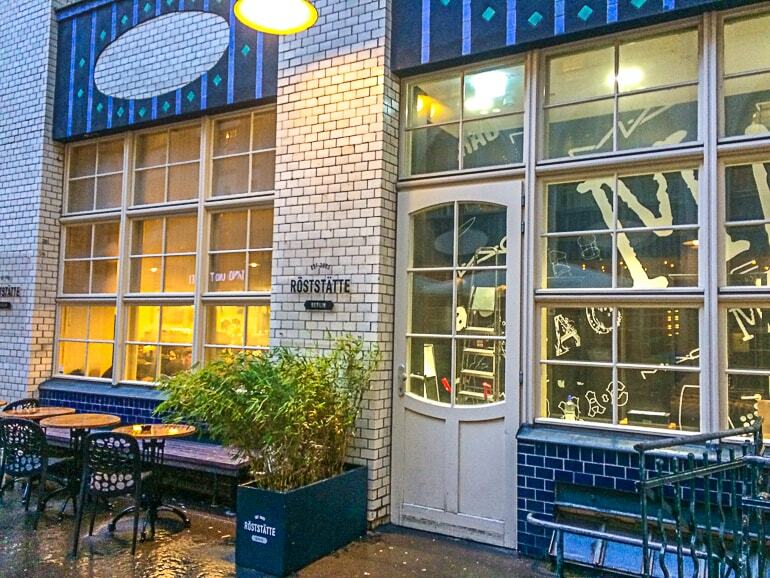 Located close by to Ben Rahim in the same cool back-alley area, you can find our other recommendation for a great coffee place: Röststätte Berlin. Lisa really liked the place. She had a green tea – and it came in a whole pot! The vibe was nice overall – not too cozy but not crazy busy like some chain places. If you want to check it out, you can learn more here. If the sky is clear, you get the sunset and then the city lights! Now that you’ve had a coffee and a sit-down, it’s time to get ready for dinner and your evening activity. For this, we’d suggest heading over to Alexanderplatz and looking up! The main square itself – Alexanderplatz – is full of shops, restaurants, and a few other sights that you may want to see. It’s also a popular transit hub. That said, you are here for the tower: The Berlin TV Tower for sunset. Called the Berliner Fernsehturm in German – it was built back in the 1960s. These days, you can visit the tower and learn about its history while taking in the awesome views of Berlin from 203 metres up. There’s even a bar/restaurant up there that rotates! If you know you want to go up for an evening visit, you can buy a ticket online in advance… which is likely better compared to walking up, buying one, and having to wait in a line. If the bar/restaurant option interested you, you can also skip the dinner we outlined in this post and opt for dinner in the tower! This ticket allows you to skip the line and snag a table reservation for dinner at a window seat overlooking Berlin. Pretty cool! Now it’s dinner time – and you must be starving since you’ve been wandering around all day exploring. So, we wanted to suggest a nice place to get a German meal in the city – Schwarzwaldstuben! Located in the north end of the city centre (north of Museum Island, actually), we ended up trying out Schwarzwaldstuben almost on accident. Lisa looked up this cozy place for a lunch in the city on our first trip together! Needless to say, we loved our meals (shown above). 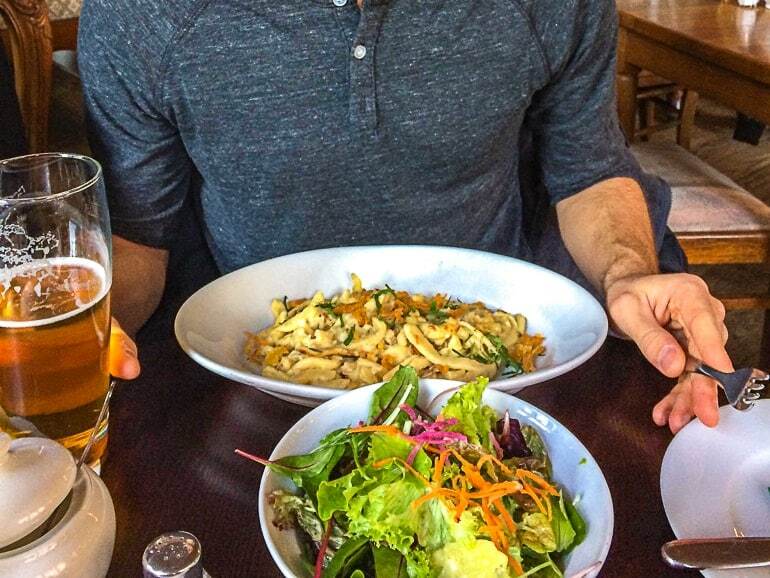 Eric had spätzle (German egg noodles) and Lisa had the Maultaschen – both were great. If you want to go for dinner, perhaps make a reservation (phone only) before if you know what time you are coming. Also good to know: they do cash only for payment! You should also know that the food that they serve is typical for another region in Southern Germany – so if you are looking for Berlin classic dishes, this wouldn’t be your first choice. If you want to check out the menu and learn more, you can check out the website here. They have an English menu on the site. This square fills with stalls for the markets at Christmas time! Well, it’s evening now – and you have a choice of things to do in Berlin to end off the day! We wanted to provide you with options to meet a diverse set of interests! At the end of the day, Berlin is known for its nightlife so you really should head out for a drink, dance, market, or performance. As for the place shown above, if it’s Christmas time when you visit Berlin you should check out the Gendarmenmarkt Christmas Markets! This whole square is filled with festive stalls and it’s quite famous. They are open until 10 pm. If it’s not the Christmas season when you visit, this area also has things like the Concert Hall and Opera House close by – among other performance halls. So, you could check out a show if that interested you! If heading out for a drink or two is more your style, you could head back to the Hackescher Markt area and find something there. The area is littered with pubs, bars, and cozy cocktail place. A favourite establishment – Mikkeller Bar – isn’t too far away from this area. We loved Mikkeller in other cities and wanted to check it out in Berlin but ran out of time. This is a good option for craft beer and you can learn more at the Mikkeller website here. Above is the Oberbaum Bridge. 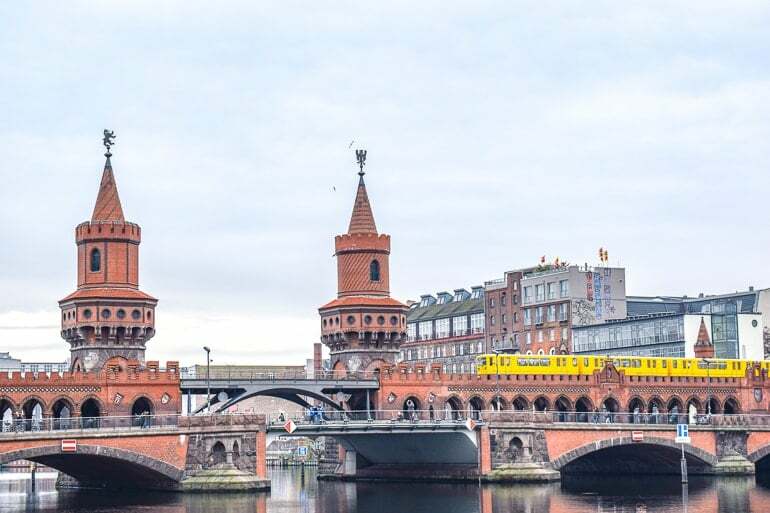 This bridge is basically the link over the River Spree from the East Side Gallery to some of the best clubs so it’s not uncommon for people to be there at all hours of the day – including sunrise. Fun Fact: The bridge used to be a crossing between East and West Berlin. So, check it out if you are over that way during the day, night, or early morning! And there you have it, our sample itinerary for one day in Berlin. In the end, you will never see everything in a single day – Berlin is just too big and full of amazing sights. However, we think we put together a detailed guide for you to get some great ideas to make your short visit perfect. If you DO follow this itinerary as is, let us know what you think!